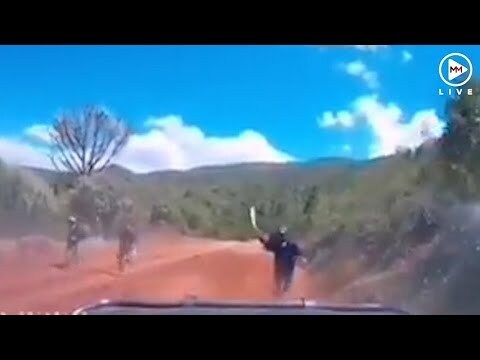 Shocking dashcam footage shows three panga-wielding men charging a Toyota Land Cruiser driven by an American couple near Mai Mahiu in Kenya's Rift Valley. Fortunately, quick thinking by the driver Bryant Swenson, who first reversed and then drove past the thugs, made for a safe escape. Swenson posted the video to the FirstPower CrossFit Instagram account of the close shave on December 1. In the car with him at the time were his wife Lauren and friends Shiv Simani and Collins Monde. "Our fitness can prepare us for life, but there are times when things happen so fast that we can only give credit to God for his protection," he wrote. "This happened yesterday on our way up to Kijabe ... We came upon three bandits robbing a matatu [minibus taxi]. I had to back up long enough to roll my window up before passing by the guy wielding the panga. 'The guy on the far left had a handgun but couldn't get it out of his waistbelt in time. "They chose this spot for ambush because the road is very rough, but fortunately we were in my [Toyota Land Cruiser] 80-series. Also thankful for a manual transmission. "Just before encountering the bandits, we passed two armed police on foot. The gunfire you hear at the end of the video are the cops engaging. We are thankful to have been gone before the gun battle erupted."